By using the drop down menus found to the right of the map, you can control the gas well information that will be displayed. 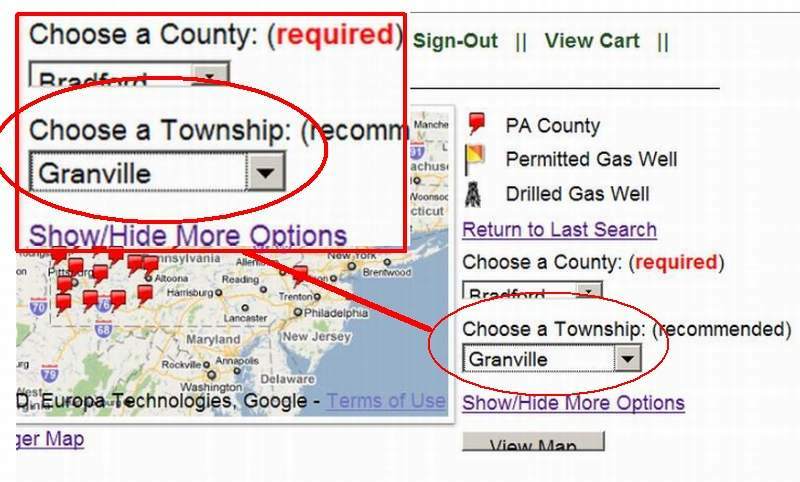 There are two primary drop down menus: County and Township. You must choose a county in order to view the map and the report tables below the map. To the right of the map, if you choose a county, and then click "Show on Map", the map will display all Well Sites that have permit information in the county you chose. Below the map, tables will also appear that display information for each Well Site, and the individual gas wells on that Well Site. 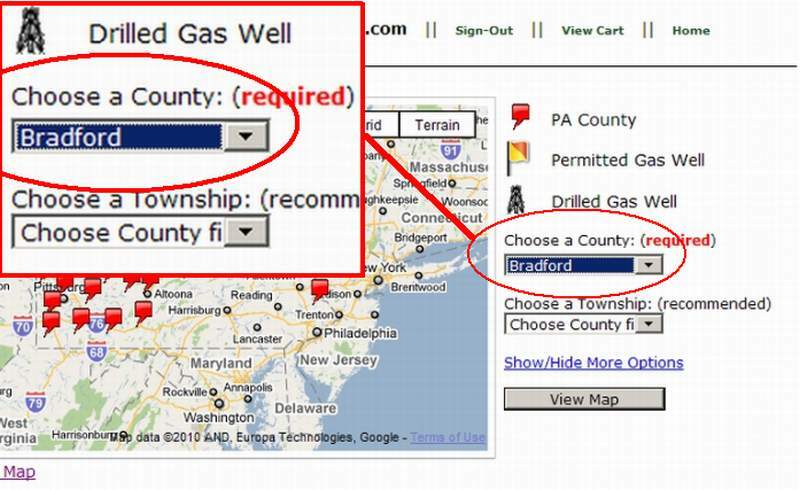 If you choose a county, and also choose a township, and then click "Show on Map", the map will display all gas wells that have permit information in the township you chose. Below the map, tables will also appear that display information for each Well Site, and the individual gas wells on that Well Site. Detailed information for individual gas wells is available as Well Data Reports. 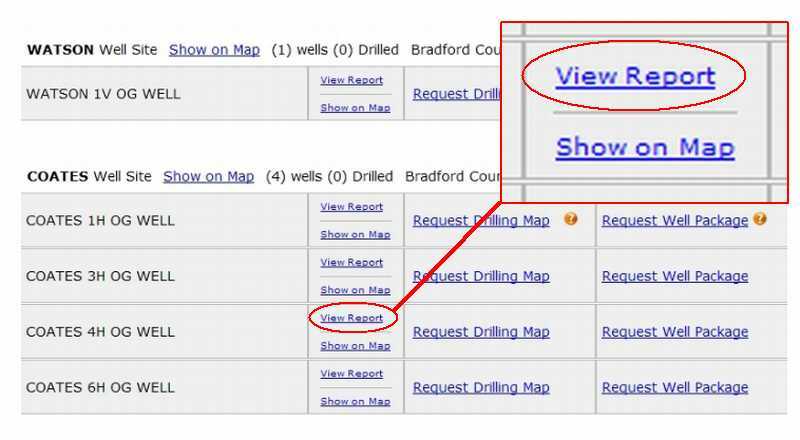 You can access the Well Data Reports by clicking the "View Report" link found in every well listing in the tables below the map. Click Here for detailed information regarding Well Data Reports. Drilling Map information typically represents the gas well drilling plan submitted to the DEP by the Gas Company performing the drilling at the well site. 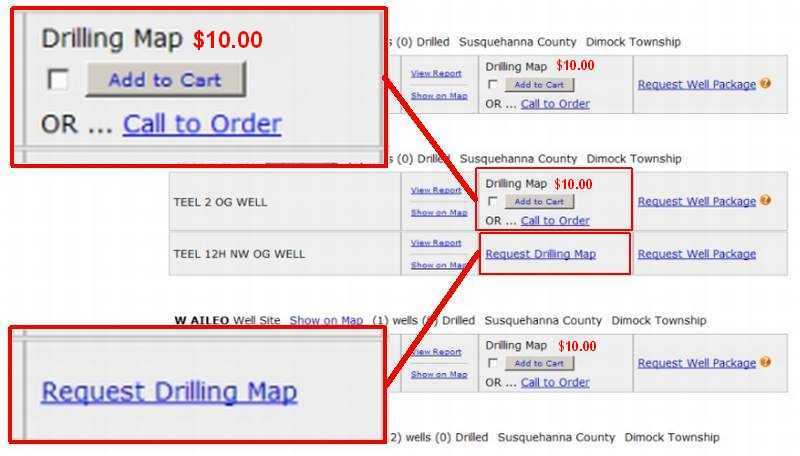 Drilling maps can be requested or purchased at the site by clicking on the the links found in the Drilling Map column in the tables below the map. When a Drilling Map is immediately available, you may add it to your shopping cart, or call to order. If the Drilling Map is not immediately available, you may click the "Request Drilling Map" link, and send MarcellusGas.Org a note requesting that we make the Drilling Map you're interested in available. There is no charge when requesting a Drilling Map, and MarcellusGas.Org will contact you when the Drilling Map becomes available. Click Here for detailed information regarding Well Drilling Maps. Well Packet information typically represents the various documents related to the well permitting process, and kept on file by the Pennsylvania Department of Environmental Protection. Well Packets can be requested or purchased at the site by clicking on the the links found in the Well Packet column in the tables below the map. When a Well Packet is immediately available, you may add it to your shopping cart, or call to order. 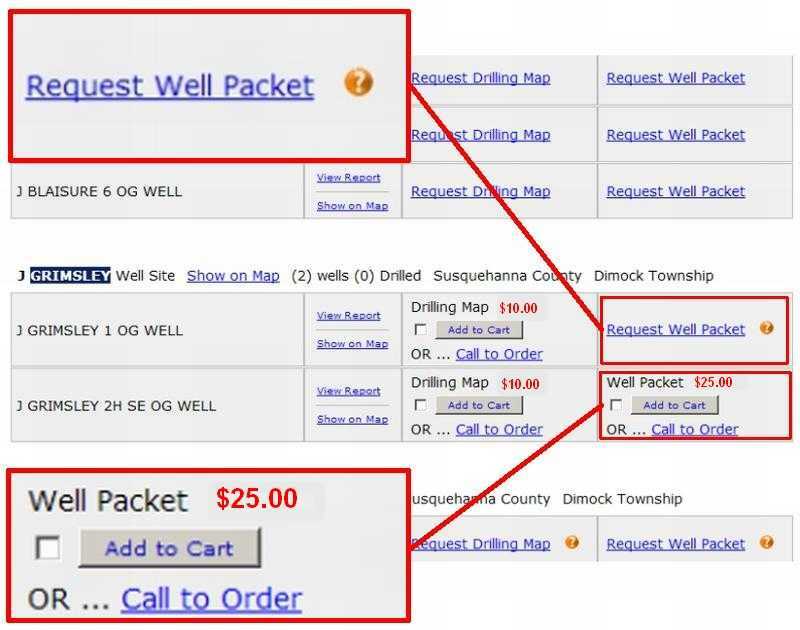 If the Well Packet is not immediately available, you may click the "Request Well Packet" link, and send MarcellusGas.Org a note requesting that we make the Well Packet you're interested in available. There is no charge when requesting a Well Packet, and MarcellusGas.Org will contact you when the Well Packet becomes available. Click Here for detailed information regarding Well Packets. There are a number of controls available for map navigation. Zoom-in: Place you mouse cursor in a non-well area of the map that you'd like to zoom in on, and double click with your left mouse button. Alternatively, move your mouse wheel foward one click at a time, or click the plus (+) sign on the vertical bar at the left of the map. Zoom-out: Place you mouse cursor in a non-well area of the map that you'd like to zoom in on, and double click with your right mouse button. Alternatively, move your mouse wheel backward one click at a time, or click the plus (-) sign on the vertical bar at the left of the map. Moving to a different area of the map: click any of the four arrows in the circle found at the top left corner of the map. The map view will move in the direction of the arrow you click. Alternatively, left-click on any non-well information area of the map (your mouse cursor will display as a hand), hold your left mouse button down, "drag" the map view in the direction of your choice, and release the left mouse button. Map Style: Map displays roads and township names. This is the default map style. Satellite Style: Map displays as an actual satellite photo. Terrian Style: Map displays as terrain style. Hybrid Style: Map display combines the satellite style and the default style. Note: We recommend using the default map style.